The supply storage area for the engine facilities offers the viewer a variety of interesting items to study. We see the many tanks housing diesel fuel and bunker C crude. 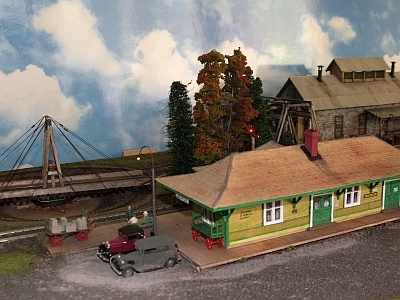 Jacques scratchbuilt the pumphouse. He is a big supporter of the use of LED's for any lights on his modules. There is a special story behind this magnificent scene. Jacques needed a low-relief scene on this module as it marries with a higher module for transporting purposes...but where to find a low relief coaling scene? 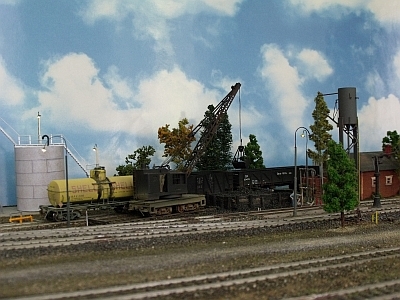 Jacques found his inspiration from a photograph of Owen Sound's coaling facilities in one of Ian Wilson's books. Jacques tells us that the old steam shovel with the clam bucket began life as a Life-Like kit which he then heavily kitbashed. Jacques scratchbuilt the red section house, one of many he has done. 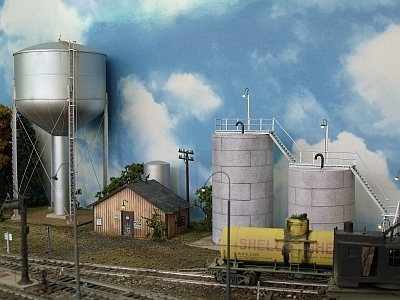 The boiler house is a scratchbuilt annex to the engine house. The engine house is a modified Campbell Kit. Looking along the track you see the outside covered work facilities with its myriad details. 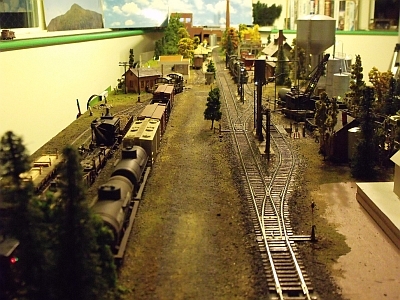 The many sections of track help make this look area resemble the busy railroad scene it is! Jacques modified the back of the standard Juneco 'Cartierville' station by eliminating the second bay area. 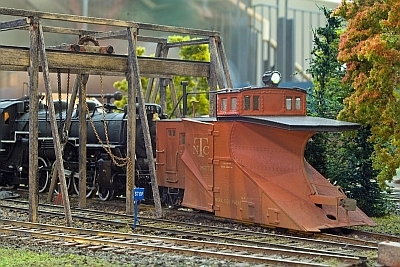 The A-Frame turntable along with the engine house combine with the station to make this a visually appealing scene. 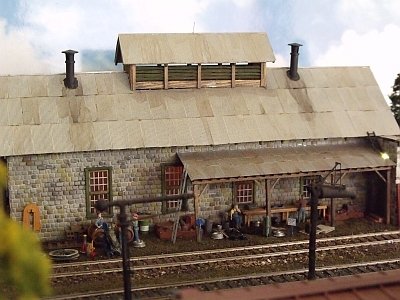 This side view of the engine house offers the viewer a peek at the outside workshop area beneath the canopy. 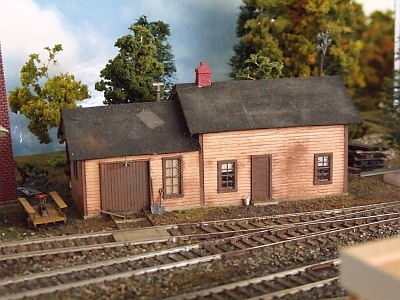 The sprinkling of appropriate details around the engine house help bring the scene to life. Jacques modified this Campbell kit by adding the clerestory up top. At track level, the left spout is for oil and the right spout is for water. Jacques modified a Durango Press overhead crane. The kit offers a crane Jacques' weathering is as impressive as his modeling talents! Jacques tells us he has built from scratch perhaps a dozen of these section houses! In this brownish-red colour with the heavy weathering it sure looks like it has seen many seasons! 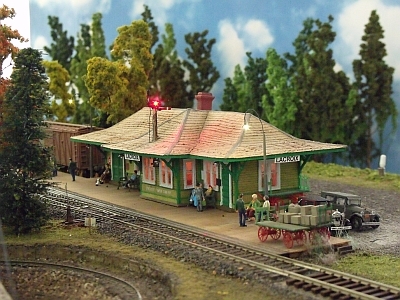 Note the small handcar to the left of the section house with its seats! This rear photo of the station shows the modification made by Jacques to eliminate the bay window at the rear of the structure. 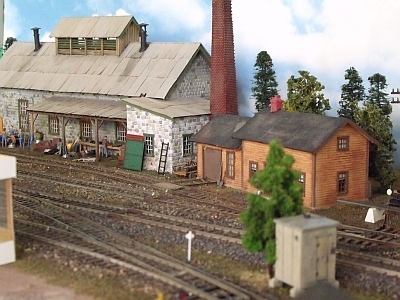 This view looking across the yard shows the sand house off in the distance along with some of the engine facilities. The gondola and tankcar in the foreground are resting in the three-track yard. This overhead view of the station shows how Jacques extended the platform. The track parallelling the platform is the team track. Team tracks are versatile industries as a great variety of freightcars can be offloaded at team tracks. The hole you see in the ground toward the upper left of the image supports the layout lamps Jacques sets up to illuminate the layout at shows. You can see the modified Durango Press overhead crane in the foreground. 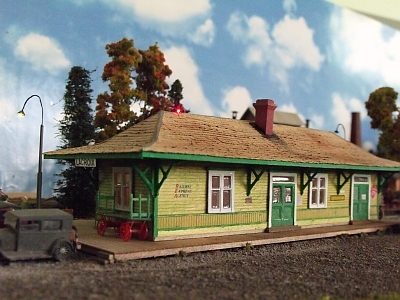 This lovely image showcases the station named after Jacques' good friend and fellow modeller, Gilbert Lacroix. Note the order board lit with LED's. 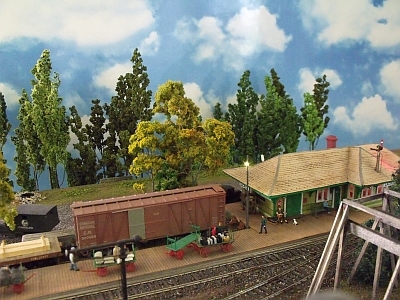 You can see the turntable pit to the lower left of the image. The baggage wagon, people and vehicles serve to bring the scene to life. Jacques is a great believer in Jordan vehicles as they fall right into the era he prefers to model! The critters are working the three-track NTC yard across the main. Some engine facilities are visible in this view as is the yard office in the distance. In the foreground, you can just pick out the roof of the sandhouse. 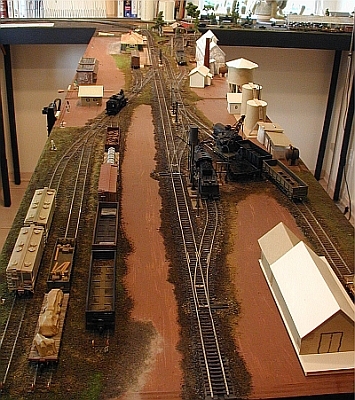 This overall view down the tracks offers a vantage point where many areas of the layout can be seen. The three-track NTC yard is to the left in the foreground with the yard office in back. The station is viewed further down the tracks to the left and the engine facilities are seen at the right. The dominant paper mill is far off in the distance. Note the structure in the lower righthand corner. 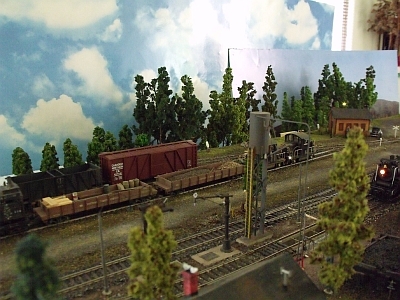 This is a cardboard mockup of the freight shed Jacques is yet to build. He'll leave the cardboard mockup in place for a few months until he is satisfied that it is the perfect looking structure for the scene. This view down the tracks highlights the station on the left with the engine facilities to the right. The massive paper mill dominates the background. Note the unfinished building in the lower lefthand corner. Jacques always makes use of cardboard mockups before he creates a structure. He lets the mockup sit in its place for a few months until he is satisfied with the 'look' before he proceeds with the building of the actual structure. 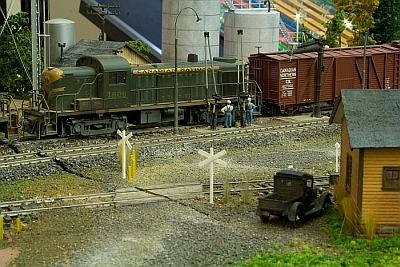 The Canadian National road switcher is kept busy working the NTC yard on Jacques' modular layout. The parking lot for the yard office is in the foreground while the large tanks dominate the background setting off this scene dramatically. 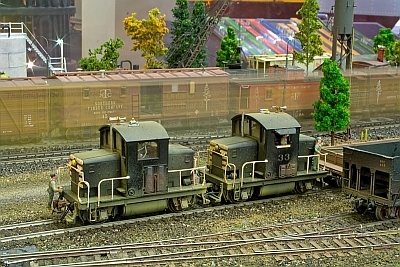 Two critters work the NTC yard while a 'ghost' train passes in the background! The giant snowplow rests below the overhead crane on the lead track to the turntable. 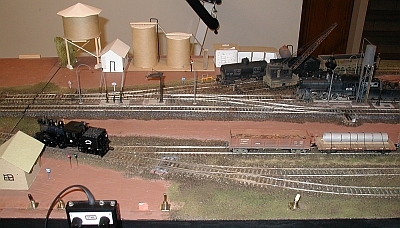 This overall view taken in the layout's infancy showcases Jacques' work in progress. This aerial view offers an overall look at the trackplan. That's the three-track NTC yard to the left in the foreground with the engine facilities to the right. The station and engine house are seen off in the distance. We see how Jacques makes extensive use of cardboard mockups for his buildings. 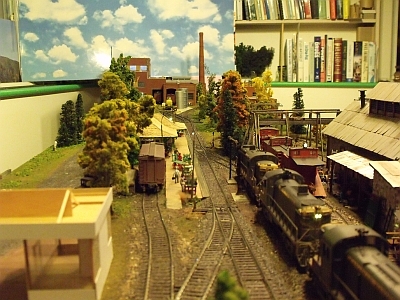 The engine facility is in business across the tracks as is the NTC yard in the foreground. We view the area around the station as it begins to develop. 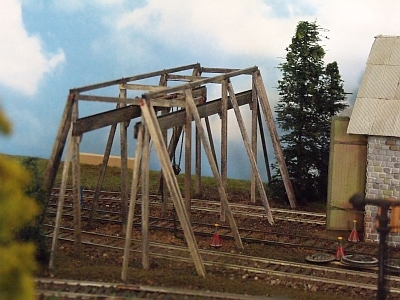 That's the overhead crane Jacques has extended across three tracks and the A-Frame turntable is a gem of a structure! 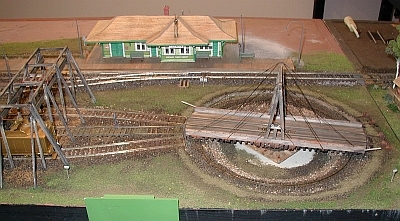 Jacques would like to thank his friend, Paul Anderson, who created the computerized rendering of the trackplan in jpeg format and planned the mill trackage. He thanks his friend, Steve Adamson for his work involving the NTC Yard. The development, design and contents of the Northern Timber Company ©2010 by Jacques Thuot.